Maj7 Chords – 7 Great Solo ideas! Maj7 Chords are one of the most important tonic chord types. 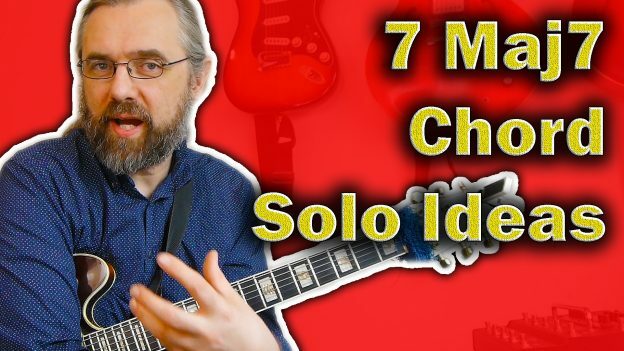 This video will show you 7 different ideas that you can use when improvising over Maj7 chords. The concepts I cover are using different arpeggio types, triad pairs and super-imposed pentatonic scales both common and more exotic. 12:35 Simple ideas from this type of phrasing. 13:20 Am & Bm – Lydian Triad pair. 16:15 How to construct and play the Emaj(b6) Penta scale. 17:40 Do you have other good suggestions you like to use? Leave a comment! 18:32 Like the video? Check out my Patreon Page! This entry was posted in Blog, News and tagged arpeggios, guitar, guitar chords, guitar lessons, how to play guitar, jazz guitar, Jens Larsen, learn guitar, maj7 arpeggio, maj7 arpeggios guitar, maj7 chords, maj7 chords guitar, maj7 chords use, major 7, major 7 arpeggio guitar, major 7th, major 7th chords, seventh chords on April 2, 2018 by jens.